As rates are going to stay unchanged due to the Fed’s decision, EURUSD is chiefly affected by the referendum in the UK. Yesterday as we mentioned, EURUSD went up to complete its correction pattern and now it has passed the level 50 of Fibonacci retracement. 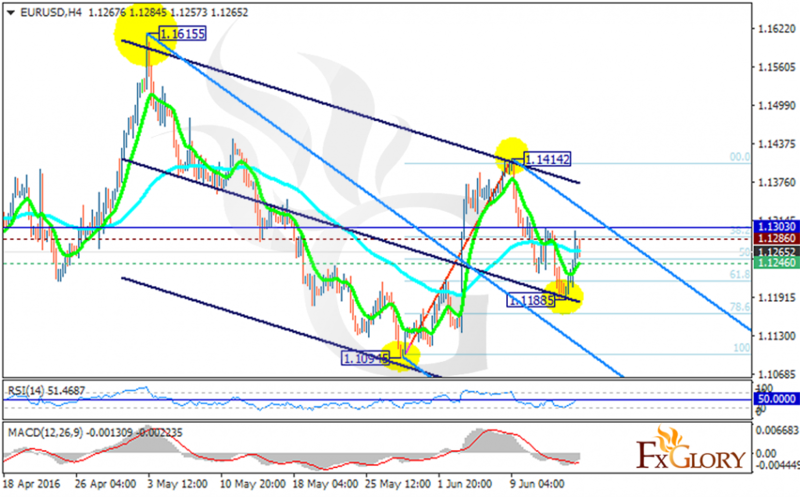 The support rests at 1.12460 with resistance at 1.12860 which both lines are below the weekly pivot point at 1.13030. The EMA of 10 is moving along with EMA of 75 with bullish bias. The RSI is staying at the neutral zone and the MACD indicator is in negative territory. The pair’s movement depends on the coming candles. The support level breakthrough will show that the reversal pattern has finished and the price would go down targeting 1.1130. On the other hand, if the resistance is broken, the pair will continue its bullish movement targeting 1.1400 .